Home / Home Brewing / Help! My Home Brew Beer Has No Carbonation! Help! My Home Brew Beer Has No Carbonation! Today, I’m going to tell you a little home brewing story. It could’ve happened to anyone, but let’s just say that this one involved a strawberry wheat beer. It seemed like the perfect beer for a hot, Florida summer – refreshing, light and lots of flavor. However, things weren’t going to go exactly perfect in this story. Brewing day went fine, bottling day went off without a hitch. Things were a little different however, after two weeks of bottle conditioning and a couple days in the fridge to cool it down. It was like a nightmare. The first bottle I opened was missing something. It had a great wheat beer flavor with a hint of strawberry, but it was missing the carbonation. I started thinking back and overall there was nothing that I missed. I didn’t forget to put in the priming sugar. I made sure that the dissolved priming sugar was mixed even into my wort before it was bottled. I add the strawberry extract at the right time. It even stumped my friends over at HomeBrewTalk.com. They suggested that I give it some more time and try another bottle. I opened the second bottle this Sunday, and by some miracle it was overflowing with foam when I cracked it open. Actually too much foam, but I’d rather have too much foam then none at all. The beer tasted great and in a couple or more weeks, it should all even out. More than likely, the cap on the first bottle was a little loose, just enough to let out the carbonation. So what would I have done if it turned out that my beer for some reason hadn’t carbed? 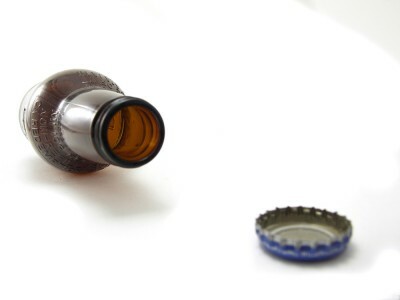 First, I would’ve made sure that it wasn’t just one unlucky bottle with a loose cap. Then, I would let them bottle condition for two or three weeks longer to see if that fixed the problem. Sometimes the yeast can be a little tired from all of their work changing the beer into wort and need a little more time. I’d also check to make sure that I was storing the beer that was someplace too cold for the yeast. Generally, 65-74 degrees is good (but, it varies depending on the type of yeast). If that didn’t work, I would buy some carbonation tablets from my favorite home brew shop. If you’re still without carbonation, leave a comment or shoot me an email and let’s see if we can’t figure out your problem.